On the 5th (Thu), get a new perspective on things with Boat Tours & Water Sports, relax and rejuvenate at some of the top local wellness centers, and then enjoy the sand and surf at Playa Hermosa. To find reviews, maps, and other tourist information, you can read our Santa Teresa route planning website . Birmingham, USA to Santa Teresa is an approximately 14-hour flight. Wrap up your sightseeing on the 6th (Fri) early enough to travel to Uvita. 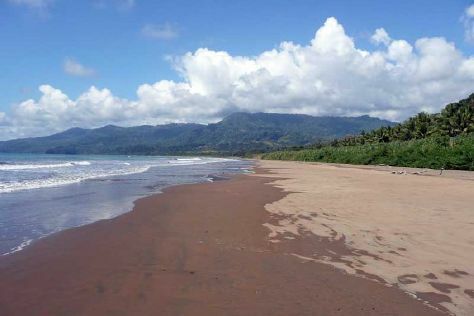 Plan my day in Uvita using traveler tips and tourist information provided by Inspirock. You can do a combination of taxi and ferry from Santa Teresa to Uvita in 4 hours. Other options are to drive; or do a combination of ferry and bus. Finish up your sightseeing early on the 6th (Fri) so you can go by car to Manuel Antonio. Step off the beaten path and head to River Rafting & Tubing and Spas & Wellness. You'll get in some beach time at Playa Manuel Antonio and Playa Biesanz. The adventure continues: scramble along the landscape with a canyoning and rapelling tour, shop like a local with Villa Vanilla / Rainforest Spices, and stop by Meli Melo Boutique. To find other places to visit, ratings, reviews, and other tourist information, read Manuel Antonio road trip tool . You can drive from Uvita to Manuel Antonio in 1.5 hours. Another option is to take a bus. Finish up your sightseeing early on the 9th (Mon) so you can travel to La Fortuna de San Carlos. Kick off your visit on the 10th (Tue): tour the pleasant surroundings at Ecocentro Danaus, then hike along Arenal Natura Ecological Park, and then relax and float downstream with a rafting and tubing tour. For traveler tips, reviews, maps, and other tourist information, you can read our La Fortuna de San Carlos trip itinerary planner . Do a combination of taxi and flight from Manuel Antonio to La Fortuna de San Carlos in 1.5 hours. Alternatively, you can drive; or take a shuttle. On the 11th (Wed), you're off tohome.